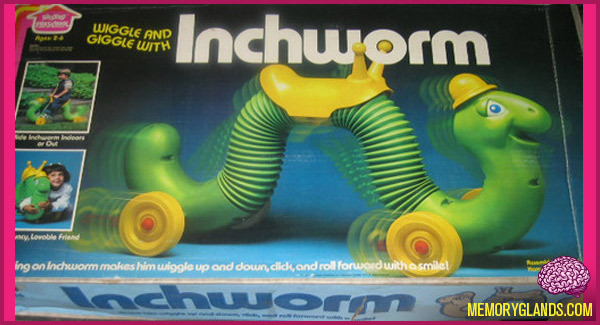 The Inchworm was a ride-on toy for children produced by the Hasbro Corporation, first introduced in the early 1970s. A scooter with yellow wheels in the shape of a green caterpillar wearing a yellow hat, the Inchworm was jointed under the saddle so its wheelbase could expand and contract. The wheels were constricted by a ratchet mechanism to rotating forward. As the rider bounced up and down on the saddle, the toy moved forward in a way somewhat resembling a Geometer caterpillar, with the ratcheting wheels making a clicking sound.